These are the terms and conditions (the "Terms and Conditions") for the purchase of the Ownaracehorse service (the "Service"). This Service is provided to you, the buyer ("you", "your") on the basis that you accept the terms of this contract. It is a legal agreement and it sets out the rights and obligations of you and Ownaracehorse Ltd. ("Ownaracehorse") including its agents, sub-contractors and all group companies ("we", "us", "our"). As part of this Service we may provide access to certain graphical and textual information, email communications, video and audio footage, photographs, text images, statistics, logos and other media and intellectual property related to Ownaracehorse or the company's licensees. All design, text, graphics, footage and the selection or arrangement thereof are the copyright of us or our respective licensees. We reserve the right to refuse to accept your purchase request. You warrant that the information which you provide when you register is true, accurate and complete in all respects. In order to use this Service or access the content, you must (a) obtain access to the World Wide Web and pay any service fees associated with such access; (b) provide all equipment necessary to make such connection to the World Wide Web, including a computer and modem or other necessary access device: we recommend that you login to our demo account area to ensure that you can access content satisfactorily; (c) have Windows Media Player (the "Software") installed on your terminal. Your use of the Software is subject to the terms of the licence granted to you by the relevant licensor. We are not providing and are not responsible for the Software, or for any problems caused by the Software, computer hardware or computer operations systems. Your right to access the Service is personal to you. You are wholly responsible for your access to the Service by any person using your terminal or point of presence and you are responsible for ensuring that any such person also fully complies with these Terms and Conditions. You agree to access the Service in a manner consistent with any and all applicable laws and regulations in the country from which you have accessed this Service. (f) access the Service from any computer terminal installed at a licensed betting office in the UK and/or Ireland. You have decided to participate in Ownaracehorse purely for the purposes of fun and enjoyment. You recognise that any involvement in Racehorse ownership cannot be regarded as an investment and, although an involvement can be profitable, that the risks of loss are high and that you might lose a significant proportion or even the full amount of your initial outlay. You recognise that, while your involvement will confer upon you many of the characteristics of Racehorse Ownership, it will not confer upon you any proprietorial interest in any Horse(s) but a right to participate (pro rata with any other participants in the same arrangement) in the amount by which any prize money surpluses generated by the horse during the period of your involvement exceed the costs to Ownaracehorse of acquiring the use of the horse during that period. Prizemoney payments are capped at a maximum of £30,000 penalty value per horse per race unless a share of 1% or more is owned, when prizemoney is uncapped. You acknowledge that ownership of the Horse for the purposes of the Rules of Racing shall, throughout the period of my involvement, remain with Ownaracehorse whose proprietorial interest in each Racehorse may, in turn, be a leasehold or other temporary interest only and that Ownaracehorse may not necessarily be the legal owners of the racehorse. You acknowledge that, for the purposes of the Rules of Racing, the registered owners, or successor in title, of each Racehorse throughout the period of your involvement shall be Ownaracehorse Ltd. – a Limited Company formed in accordance with the Rules of Racing. You accordingly acknowledge, in relation to the Racehorse, that complete authority in relation to the Racehorse shall be vested in Ownaracehorse who shall manage those horses during the Share Period, for the rateable benefit of you and all others involved in the racehorse and so that you and the other participants in the racehorse will share pro rata, according to your respective entitlements. When attending yard visits at trainers premises or attending the races with Ownaracehorse as an Owner Ownaracehorse will not be liable for any personal injury. You attend these events at your own risk. Racecourse rules state that Children under 16 are unable to be admitted to the parade ring at any racecourse. We have some simple rules regarding general behaviour, badge allocation and racecourse attendance. You agree to behave in an orderly and respectful manner when communicating with Ownaracehorse, at the races, to our Helpdesk or attending yard visits. Disregard of reasonable safety instructions and requests, or disruptive behaviour at the races or yard visits will result is your share and the service being suspended without notice. Any threatening, slanderous or abusive communications will result in your Horse Manager Account being terminated without notice. Further details are posted in the 'Help' area of the 'Horse Manager'. All decisions relating to the Horses, trainers, administration, and general management, shall be vested in Ownaracehorse. You must pay the share purchase fee (the "Fee") applicable to the specified horse in accordance with the fee notified to you at the time of purchase. The Fee will be automatically billed against the credit/debit card number that you provide in the registration form. Our payment agent will notify you by email that we have debited your credit/debit card and that you have been granted access to the Service. The email message will constitute our acceptance of your request to access the Service. Our acceptance of your order will be deemed complete and received by you at the time and date we send the email, which time and date is specified on the email. We accept no responsibility for you not actually receiving the email for reasons outside our control. Once you have paid for the Service or a Gift Pack, no refunds or cancellations are permitted. Gift Vouchers may only be used to purchase racehorse shares, no cash refunds are permitted. We are providing the Service and System on an "as is" basis and make no representations or warranties of any kind with respect to either the Service or System or their content including (without limitation) implied warranties and/or conditions as to completeness, accuracy, satisfactory quality and fitness for a particular purpose, except to the extent required by law and/or conditions. We do not warrant that the Service will meet your particular expectations or requirements or that it will be uninterrupted, timely, secure or error-free, nor do we make any warranty as to results or the accuracy of any information obtained by you through the Service, except to the extent required by law and/or conditions. Additionally, and save as required by law, no term which, but for this disclaimer, would or might be implied by law so as to constitute a term hereof shall be implied. If and to the extent that it may be applicable to these Terms and Conditions section 13 of the Supply of Goods and Services Act 1982 is hereby explicitly excluded. Neither we nor any of our directors, employees or other representatives (nor the directors, employees or other representatives of our agents, sub-contractors or group companies) will be liable for damages, in contract, tort or otherwise including negligence, arising out of or in connection with the provision of access to the Service. You confirm that we shall not be liable to you or any third party for any modification to, suspension of or discontinuance of the Service. This is a comprehensive limitation of liability that applies to all damages of any kind, including (without limitation) compensatory, direct, indirect or consequential damages, loss of data, income or profit, loss of or damage to property and claims of third parties. We do not limit or exclude our liability for death or personal injury resulting from our negligence. In no circumstances shall any liability of Ownaracehorse hereunder to any person purchasing the service exceed the amount paid by that person. (c) a court or competent regulatory authority requires our provision of the Service to be terminated. We grant you a non-exclusive, non-assignable, and non-transferable licence to use, view and display, for personal use only, one copy of any material that you may be required to download in order to access the Service, including, but not limited to, any files, codes, audio, or visual images incorporated in or generated by the software (collectively "Downloaded Material") provided, however, that you maintain all intellectual property related and other notices contained in such Downloaded Material. You acknowledge and agree not to sublicense, assign, or otherwise transfer this license or the Downloaded Material. You also agree not to alter, disassemble, decompile, reverse engineer, or otherwise modify the Downloaded Material. You agree to fully indemnify us immediately on demand against all claims, liability, damages, costs and expenses, including legal fees, arising out of any breach of these Terms and Conditions by you (or any other user in your household or anyone else who may access the Service through your terminal using your password) or any other liabilities arising out of your or their use of or access to the Service and/or the System. You shall provide us with notice of such claims, full authority to defend, compromise or settle such claims and reasonable assistance necessary to defend such claims, at your sole expense. You may be subject to taxes on your registration, which are levied in respect of the Service. These duties and taxes plus any additional administrative charges for customs clearance must be borne by you; we have no control over these charges and cannot predict what they may be. Customs and taxation policies vary widely from country to country; you should contact your local customs or tax office for further information. Any notices we send will be sent to the email address you supply during the registration process. Any notices you send us should be sent by email to helpdesk@ownaracehorse.co.uk. Notices will be deemed to have been delivered, whether dispatched by e-mail or otherwise, at the time of receipt. If we fail to exercise or enforce any right we have under these Terms and Conditions such failure will not be deemed to be a waiver of that right nor will it prevent us exercising or enforcing that right on a later occasion. If any provision of these Terms and Conditions is found to be illegal, devoid of legal effect or unenforceable, these Terms and Conditions shall be construed as if the relevant provision had been deleted. No refunds will be made in connection with any postponement or cancellation of events, for whatever reason. Users are required to register to use the Ownaracehorse Horse Manager, access to the owners areas requires the user to open a owners account with Ownaracehorse by completing a registration form. The right to use the account is personal to the user and the user shall be responsible for protecting the confidentiality of the password, and for ensuring that no unauthorised access is obtained to the Ownaracehorse. The user is fully responsible for all actions undertaken using the password for its account. We monitor all individual accesses to the Ownaracehorse owners area and will suspend accounts who are misusing their membership. We allow 2 IP addresses per day to access the owners area on a single account. Any more than two IP addresses detected in one day will freeze your account immediately. Ownaracehorse may terminate the users access to the owners area immediately without notice if the user is in breach of any of these terms and conditions or may terminate the users access to the owners area if any charges for these services are unpaid. In the event of such termination, the user will not be liable for any refund of monies paid for Share Periods which have not reached their expiry date. As required by the Data Protection Act 1998, Ownaracehorse follows strict security procedures and takes appropriate measures to ensure that the users personal information is not damaged, destroyed or disclosed without the users consent and to prevent unauthorised access to it. However, Ownaracehorse cannot be responsible for and therefore excludes all liability for loss or misuse of personal information which is intercepted or otherwise misused by unauthorised persons. Copyright in all Ownaracehorse postings is strictly reserved by Ownaracehorse and no material therein may be stored or recorded in any storage and retrieval system, mechanical, electronic or photographic and no part of it may be transmitted or reproduced in any way without written permission of the Ownaracehorse. 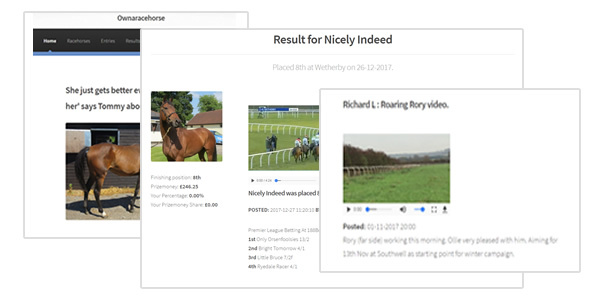 This website is provided subject to the conditions that, when otherwise supplied, it will appear in the same form in all respects exactly as supplied by Ownaracehorse and that neither the content or the advertising material therein or any other content of Ownaracehorse may be altered, varied, added to or subtracted from without their prior consent in writing. Ownaracehorse and its partners shall take all reasonable steps to ensure a high quality Service. However, we cannot control Internet network congestion that may occur and affect the quality of the Service. We are not responsible for any suspension of service that may occur in content that is received from other third parties. For certain services we will accept purchases only from residents of certain geographical areas. This will be indicated clearly at the time of purchase. You are responsible for respecting this clause. If we believe you have provided false information, we reserve the right to terminate this contract and your access to the Service. We will not be liable to you for any breach of these Terms and Conditions by us due to any cause beyond our reasonable control. We reserve the right to vary and/or update these Terms and Conditions from time to time without notifying you. Updated Terms and Conditions will be posted on this website and can be viewed by you at any time. We recommend you check back regularly to ensure you are aware of any changes. Changes to the Terms and Conditions will be deemed to have been accepted by you if you continue to access the Service from the date the updated Terms and Conditions are so posted. We may assign or transfer all or any of our rights and obligations under these Terms and Conditions to a group company or other third party. In the Service of assignment or transfer, notification will be given to you by e-mail. This Agreement constitutes the entire agreement between us and you with respect to this subject-matter and excludes any representations or warranties previously given or made other than any fraudulent misrepresentation and it may be amended only by us on notice to you. These Terms and Conditions and your access to and use of Service are subject to the laws of England and Wales and you submit to the exclusive jurisdiction of the courts of England and Wales.